With OTS Rent-a-car, free transfer service for customers who stay at any hotel located w/in Naha City. Need a car for urgent use? Book through our website or give us a call at 098-856-8877. Bookable 1HR before use !! ※Only for accommodations with front desk facility. This branch provides transfer service for customers staying at hotel located in Naha City and transfer to/from ports (customers arriving/departing by Queen Zamami and Marine Liner Tokashiki). 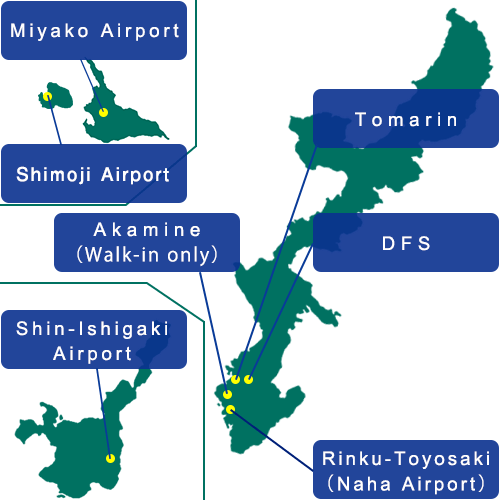 ※Tomarin branch does not provide transfer service to/from Cruise ports. For customers who arrive by cruise, kindly make your own way to Tomarin branch for car collection and to your next destination after car return. Please confirm the car pick-up and return location below. ※Please wait at the hotel lobby.